The vast majority of single-vehicle crashes occur in a curve. Many times these crashes are the result of an assumption that the corner will be easy to negotiate, only to find that it suddenly tightens or there is a mid-corner hazard. Negotiating most curves is fairly easy as long as you enter at conservative speeds that require lean angles that are well within your personal “lean-angle” limits. Mid-corner obstacles or surface hazards that require advanced braking techniques can also make an otherwise easy corner a real challenge. And if you’re like most riders, you do not have proficient enough skills to handle these types of complex cornering situations. The best riders use their brains so they don’t have to use their muscles. In other words, they use strategies and good judgment that nearly negates the use of superhero cornering and braking skill. They certainly have these skills in spades, but they know they are doing something wrong if they need to use them regularly. But, even the best riders have to manage an unexpected mid-corner hazard from time to time. So, let’s go over how to either maneuver around a corner hazard or stop if we can steer around it. Sometimes we are faced with a situation where you encounter a fallen branch, a patch of sand or diesel fuel spill that you must avoid. If the hazard spans the whole road, you may need to stop (see next section). But, many times the better choice is to maneuver around the problem. Let’s say you lean into a turn, and about halfway around the curve you spot some debris. You have to make a quick choice about whether to maneuver inside or outside of the problem. If you have the room, it may be better to go around the outside of the problem (go around the left of the obstacle in a right hand turn and vice versa). However, this may be a poor choice if it means that you risk going off the road or into the oncoming lane. Also, once past the obstacle, you will have to quickly turn to stay in your lane. The other option is to tighten your line and go to the inside of the obstacle. This requires you to lean quickly by pressing firmly on the inside handlebar. Done correctly, this option keeps you in your lane, but asks a lot from your tires and your confidence to achieve more extreme lean angles. Also, in a left-hand turn this may bring you dangerously close to the oncoming lane as your upper body hangs well over the centerline. Another reason why this option may not turn out well is if you fail to turn tight enough to actually avoid the hazard…and you’ll hit the object at a greater lean angle. Not good. Sometimes our only option is to slow down or stop. Unfortunately, traction is limited and adding significant brake force will likely overwhelm traction. To safely introduce significant stopping power without falling you must make traction available by first reducing cornering forces. There are two basic techniques for stopping quickly in a curve. Brake as hard as you can without skidding and then brake harder as the bike straightens. This option is the one to choose if you must stop very quickly. First, straighten the motorcycle upright by pushing on the outside handgrip (countersteering). Once the bike is no longer leaning you can apply maximum braking. Brake progressively to avoid skidding. Read more about proper braking HERE. A hybrid version of these two techniques involves partially straightening the motorcycle before braking. This allows stronger initial brake force compared to the gradual straightening method, and it allows the motorcycle to stay on a curved path. Trailbraking is a technique that is done by continuing to brake beyond the turn-in point and then gradually “trail” off the brakes as you lean fully. But, trailbraking is intended to be used as a planned technique to refine cornering control and not as a way to salvage a blown corner entry and is not defined as a technique for avoiding a mid-corner hazard. That said, riders proficient at trailbraking will find the “brake while straightening” technique less intimidating to execute. Trailbraking is often used to fix a too-fast entry mistake. If you are adept at trailbraking, you can brake past the turn entry while still maintaining a relatively relaxed composure (depending how overspeed you are). You may have salvaged the miscue this time, but slow down! Charging into corners will eventually bite you hard. Slow more than necessary…you can always get on the gas if you slowed too much. No matter which method you choose, if you can’t avoid the object, straighten the bike so you hit it as upright as possible where you stand a better chance of not crashing. It is important to note that most anti-lock braking systems on the road today cannot prevent a cornering slide due to overbraking. However, some newer ABS systems can now detect sideward slides and prevent falls from braking hard in corners. Aren’t electronics amazing? As you can see, handling mid-corner obstacles can be tricky. 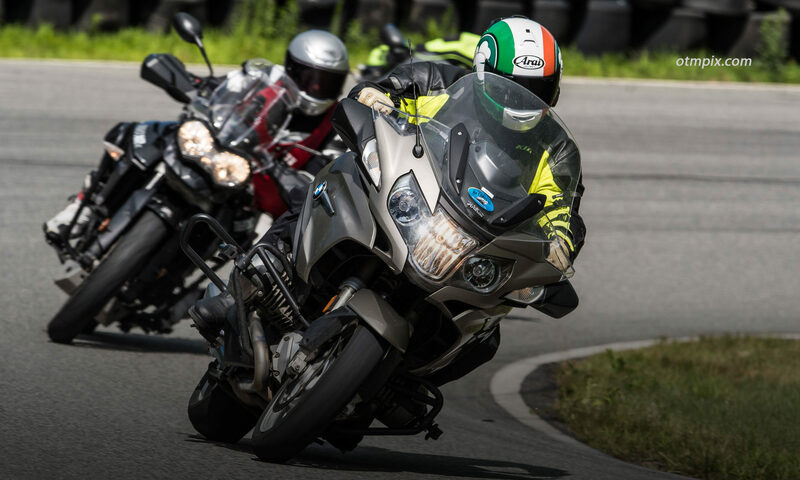 The best way to manage these hazards is to predict them and ride so that you always have options of either maneuvering or stopping with minimal drama. This usually means entering turns a bit slower than you think you need to and practicing your leaning skills so both become second nature. These are great techniques Ken. This time of year it is important to have these in mind with all the Spring time debris on the roadways. I have used many of these variations to “Make it home” more than once. I can’t recommend enough for riders to practice these techniques when it is not an emergency. I had occasion the other day to try this. I was entering on the outside into a blind right turn when I was confronted with a big, fat SUV halfway in my lane passing two bicycles in his. I had to lean a bit harder to get to my right side in a hurry. Fortunately, it wasn’t a close call either – I passed him with about 2 feet to spare. Earlier this year I came around a left turn and saw a patch of slushy snow in mid-turn. I straightened the bike, pulled the clutch immediately before, and gently coasted over it in a straight line, neither slowing nor accelerating. I have practiced dealing with mid-turn surprises by forcing myself to treat some innocuous irregularity or mark as a hazard. Pretend that old skid mark is a fresh diesel spill and stay outisde of it. Or in a familiar turn, totally alter my line to something I would never take. I call these “rehearsal drills”. As always when trying something new, do it at reduced speed, so your brain is able to work out the details in real time. With practice, you gain the flexibility to alter a line without that conscious thought. The one time this paid off for me was on a narrow road when an oncoming dually pickup took up most of my side of the road in a right curve. Focusing on the space available I was able to reposition myself to thread the needle. This is a useful skill to practice, and remember that the harder you are going into the corner the less room to negotiate the hazard you will have. Also don’t forget hazard fixation – if you stare at the hazard you’ll probably ride into it! Re-read this post my personal instruction day Thursday. It’s all coming together. Thanks for writing these. Thanks to those who wrote the great responses above. Practice practice.